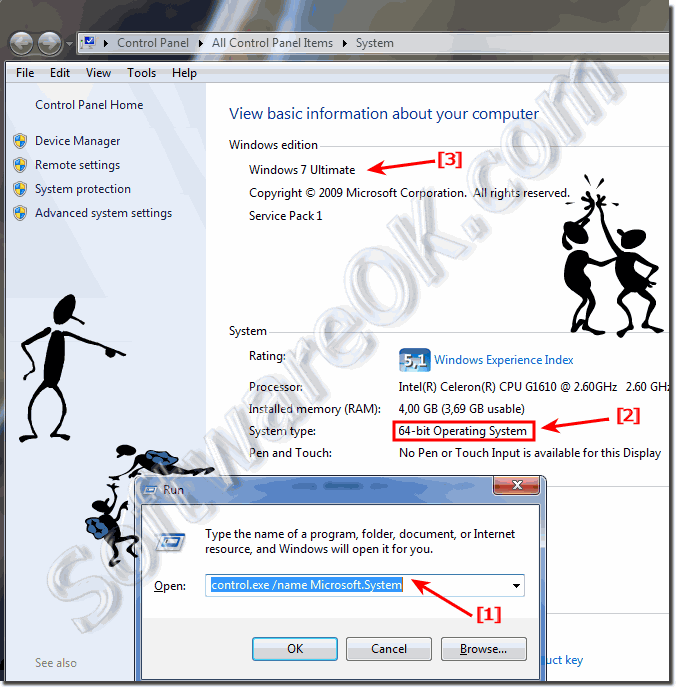 The solution is simple to see your Windows 7 Edition and if it is x64 or x32(x86) e.g. 64 Bit or 32 Bit OS! 1.) ... Is my Windows 7 a x64 or x86 Edition? 2.) ... More information about the Windows 7 Edition! Tip: ► performance index rating on Windows 10! 1.) Is my Windows 7 a x64 or x86 Edition? To start the Windows-7 Run-Dialog use the keyboard shortcut Windows-Logo+R! the System Icon can you also find in Windows-7 Control-Panel! (Image-1) Is my Windows-7 x64 or x32! 2.) More information about the Windows 7 Edition! 2.) It is also about the cmd.exe with the command "systeminfo"
Windows-7 - FAQ-86: How can I see in Win-7 if I have Windows x32 / x86 or x64 Edition?